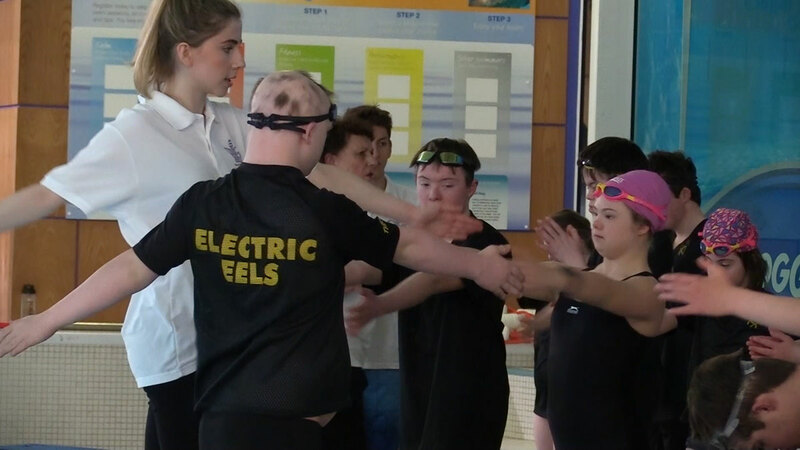 To mark World Down Syndrome Day 2019, Dan Richardson visited Electric Eels Swimming Club, which helps to transform the lives of young people living with Down Syndrome. The founder of Electric Eels Swimming and Synchro Club has said it would not exist without volunteers. Pauline Walker praised the work of those who give up their time to help children with Down Syndrome to learn to swim. Electric Eels is the only club in the country which teaches children with Down Syndrome from beginner through to competitive level. Pauline gave all of her volunteers possibly the best praise they could receive, saying: “I can’t run the club without the volunteers. “Obviously if you’ve got a non-swimmer, some of these children get frightened because they’ve never been in the water before, so you need to have young people who can empathise with them. One of the volunteers, 22-year-old Anna Weaver, has been at the club for around nine years and has covered many different roles. She said: “I’m a volunteer coach so, every week, I teach two lanes of children how to swim – they’re quite advanced swimmers. “Some of them have GB times and they do competitive swimming so they attend lots of galas and things, so I prepare them for that. I also look after some of the other swimmers as well who are still learning. “It’s really nice. I used to help out in the water with the brand new swimmers who are a lot younger but now I run my own lanes and the club sponsored me to do my coaching qualification so I’m now a professional coach which is really good. Two of the male volunteers, Matthew Saunders and Colm Unger, spoke about how the volunteering helps them outside of swimming. Matthew said: “It gives you a lot of confidence just to be able to speak to other people and it also makes it easier to work with kids and work with adults in different scenarios. The number of volunteers each week for training are in double figures, with even more on a waiting list to join. This enables more opportunities for swimmers to join the club than in previous years. Catherine Novis, mum of Vivian who swims at the club, said: “The volunteers are wonderful. It’s good to see how it’s changed over the years. “It used to be that they had to turn people away because they didn’t have enough volunteers, so it’s lovely to see.